Spirit Communication (communicating with your dead loved ones) is more art than science; more “general concept” than “detailed manuscript”. I’ve shared before how I communicate with your loved ones in Spirit. If you’re interested in reading about the mechanics of mediumship, read this post. Today’s blog is to share more details about the translation component of my job. Again, what I’ll share here is how I work. My work style may be similar to other mediums with whom you might work, or it might be completely different. I provide a framework for Spirit regarding how I desire to work with them and how they can most easily communicate with me. I allow each Spirit the latitude to infuse their own personality by using whichever Clair (for more information about Clairs, read the blog at the link above) they desire to use. Some mediums will work through a Spirit guide to communicate with your loved ones. I prefer direct communication, so my spiritual team ensures my safety and that all Spirits “behave”, but aside from that, my spiritual team literally has my back. My team is behind me, out of the way of YOUR spiritual team, so I can focus solely on you. For me, this ensures I’m not blending my issues with your issues. I know that whatever is in front of me, or felt in my body, or communicated to me through ANY of the Clairs during our time together is about you. Interestingly, sometimes Spirit will take the opportunity to provide a “twofer” message. Once in a while you and I need to hear the same message, so your team will tell me the message and I’ll translate to you, but I will also receive the message for myself. However, this happens infrequently. Typically, your reading has absolutely nothing to do with me—I’m just the translator. When I receive information from your dead loved ones, some are better communicators than others—just like some people with bodies (corporeal beings / living people) are better communicators than others. Ironically, I have more consistent luck understanding the quirks of the communication styles of Spirit than I do people with bodies. Primarily because when I communicate with living people, I tend to be more in my “analytical mind” and I focus more on the actual words spoken instead of nonverbal communication; wereas when I communicate with Spirit, I am in my “psychic mind” (aka “creative mind”) and I tend to receive a more comprehensive feeling about the message. Effective communication consists of so much more than just words. Spirit communicates a word, phrase, concept, feeling, picture, or other message to the medium using the Clairs. Using her own frames of reference, the medium then provides a translation to the sitter of the message received. The sitter then receives (hears) the message that the medium spoke. The sitter then uses his/her own personal frames of reference (knowledge of the dead loved one, understanding of the words that the medium used, etc.) and (if possible) visual cues of the nonverbal communication to interpret the message the medium translated. To ensure clarity, the sitter should ask pertinent questions to gain clarity and ensure the message is understood. Keep in mind that the medium doesn’t know your loved one, so the medium may mistranslate the message your loved one has provided. 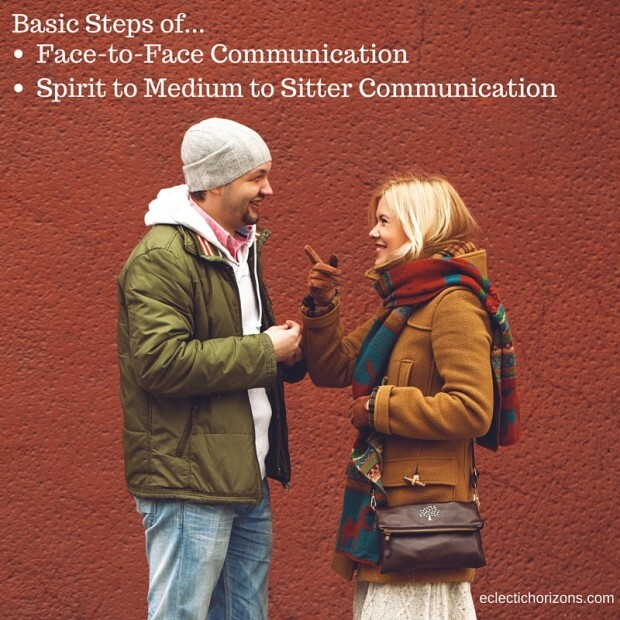 Just like you sometimes have miscommunications with another living person when you communicate, it is possible to have a miscommunication during a session with a medium. For example, in the message above, maybe your loved one used the word “Pisces” but actually meant “fish”. Maybe your loved one actually was making reference to a memory of the two of you fishing together. It is so important for a sitter to ask for clarity and speak up during a reading when a message doesn’t make sense or you’re not sure if you have understood the message the medium has translated to you. During the reading, if you request more information, the medium can request more information from Spirit. After the reading, when the link between the medium and your loved one is broken, it will be much more difficult for the medium to reinterpret the message, because with the link broken, the medium cannot ask for more information from the Spirit.